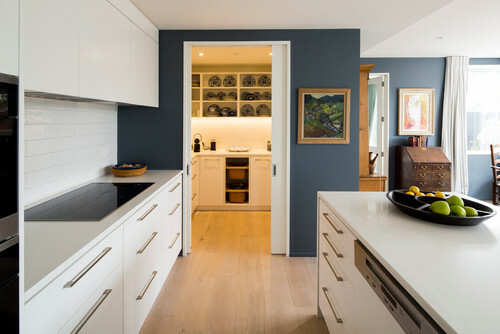 Yanic Simard Houzz Contributor. Founder, owner and principal designer of the award-winning residential interior design boutique firm Toronto Interior Design Group. 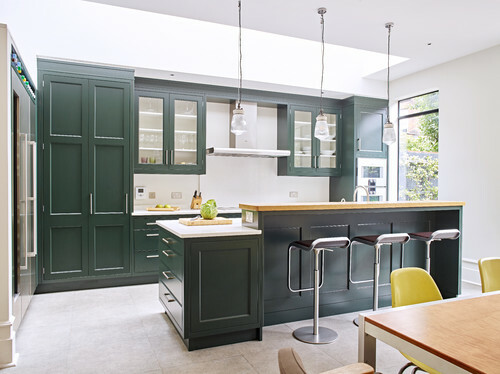 Planning a dream kitchen and facing reality can be two different things. In a perfect world we could have endless pantry storage at our fingertips, but sometimes fitting a pantry into the kitchen (or elsewhere in the home) takes some compromising — or at least a little creativity. 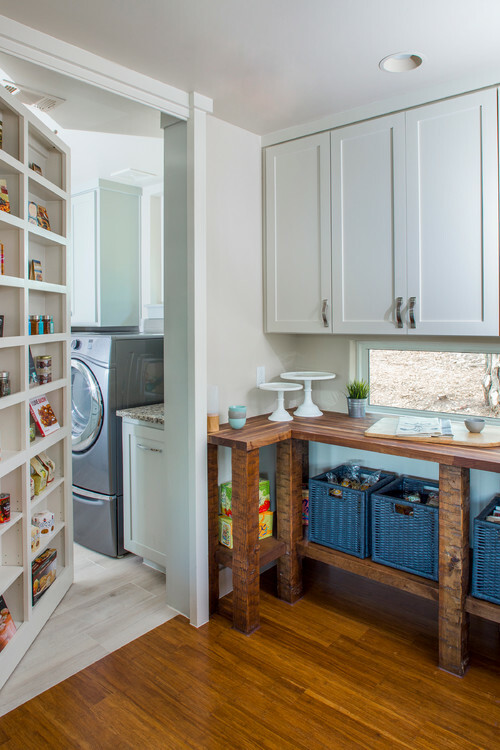 Here’s a wide range of ideas for where you might best fit a pantry into your home, so you can find an option that works best for you. One downside of this solution that should be noted is the loss of some counter space, compared to using standard upper and lower cabinets with a stretch of counter between. 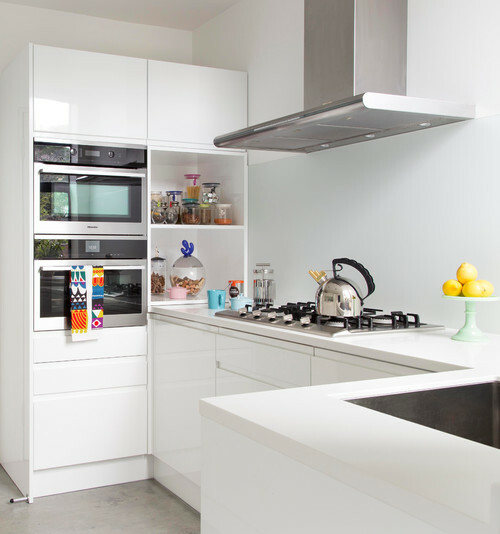 However, using a tall full-depth cabinet provides a great deal more storage capacity and gives the kitchen a weighty and mature air. Plus, it gives you more surface area to paint in a rich hue if you so choose. If you have a nearby island to act as prep space, losing a little counter may be well worth the trade-off. 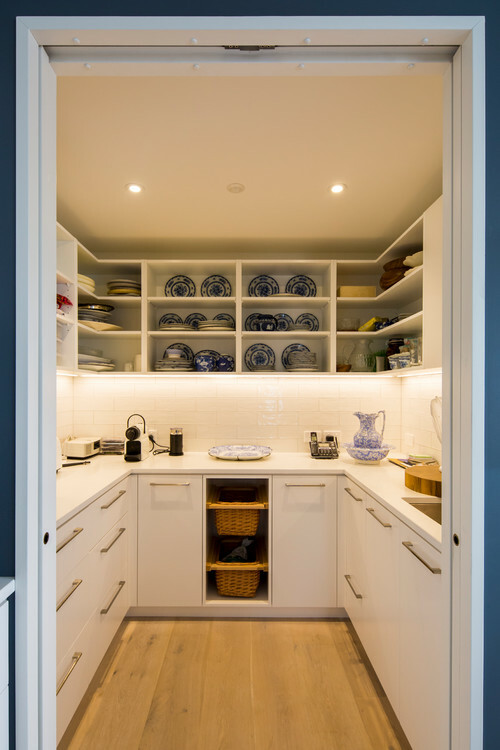 Rather than adding a full set of cabinets to a wall, consider using a single cabinet (either a built-in or a standalone unit safely anchored to the wall) to create a pantry without filling in a whole wall. This can create a beautiful accent in the room, contrasting other cabinets a bit and becoming a focal point rather than just a functional piece of storage. Plus, if you use a sturdy cabinet, it can later be moved to a new home more easily than a true built-in. Just be sure to anchor it carefully. 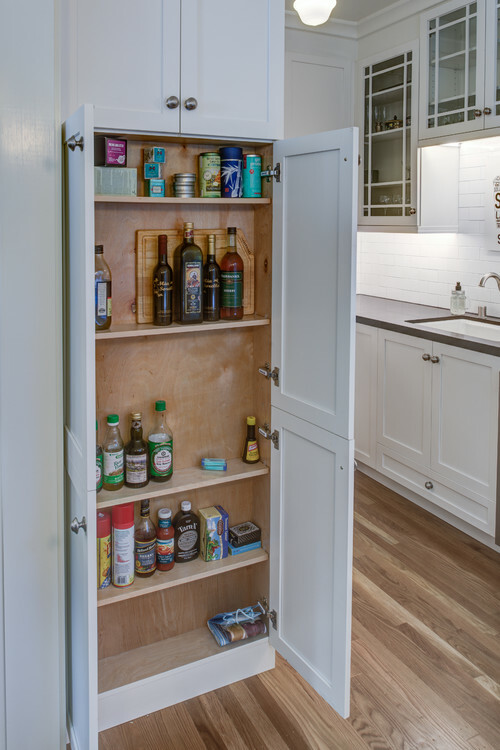 For a more traditional look, a relatively small bit of construction can convert a typical doored closet into a niche for a pantry cabinet — either a custom-sized unit or a few prefab cabinets with slim filler panels on the ends to give a seamless look. Consider giving this pantry cabinet its own finish (like the beautiful soft blue-gray pictured here) to act as an accent. 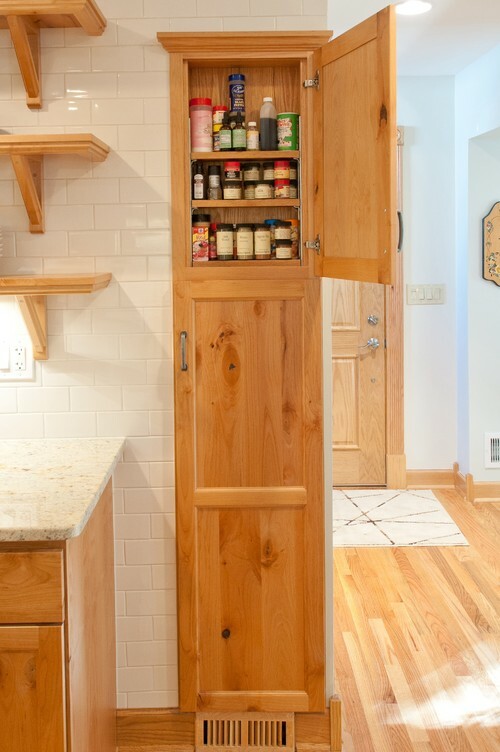 This is also a clever way to avoid having to match a newly added pantry to existing cabinets. Rather than adding an actual cabinet, you can convert a closet into a pantry by adding a variety of shelves or drawers to allow for storage of smaller items. Baskets are useful for storing some items, but for frequently accessed goods and tools, investing in a few proper drawers will give better functionality. Looking to make some bold changes during a renovation? Converting an extra room of a kitchen into a pantry may be a better use of space than, say, a rarely used breakfast nook or den, especially if you really find yourself spending more time in the kitchen itself. 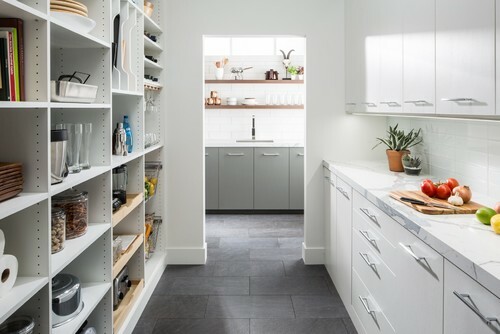 If the converted space is large enough — and especially if you can route in water lines for a sink — the new pantry can also work as a prep station for a second chef. If this is your goal, use separate uppers and lowers for at least one wall to allow for some useable counter space. 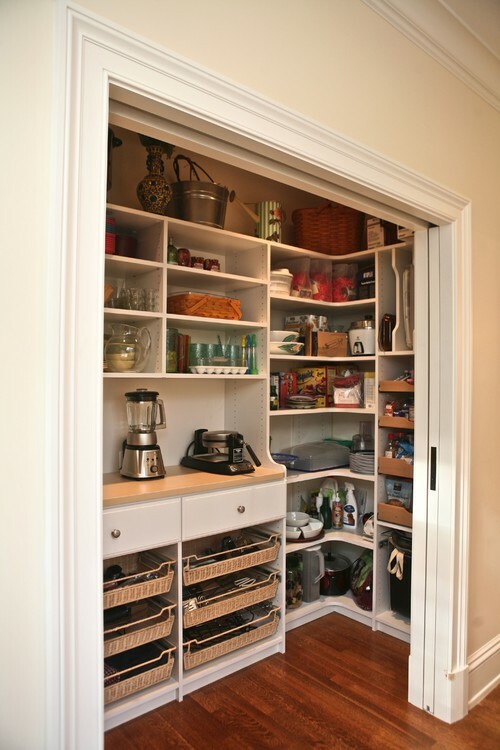 You can also consider using some open cabinets without doors to put everything within immediate reach. 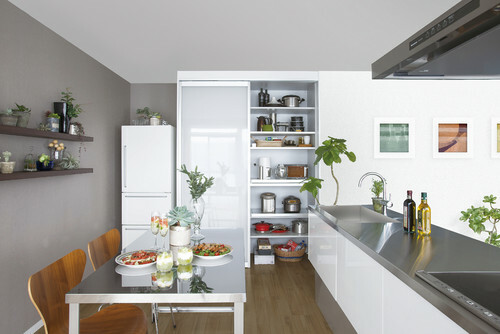 When using stock prefabricated cabinetry in a kitchen, oftentimes the available cabinet sizes won’t add. Shelves only a few inches deep may not have many uses outside the kitchen or bathroom, but here they’re great for storing spices, bottles, jars and other petite containers, all within easy reach. 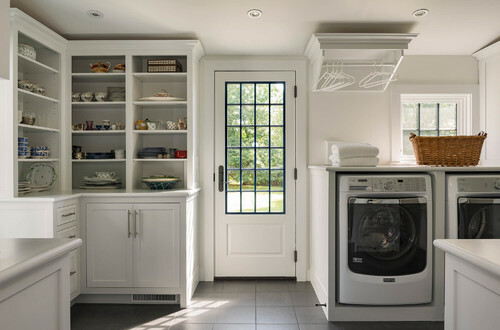 A dream laundry room is big and breezy enough to have ample space to work in and alleviate some of the drudgeries of washing and folding with a little natural light or fresh air. However, even the most covetable laundry rooms only need so much storage for laundry supplies. 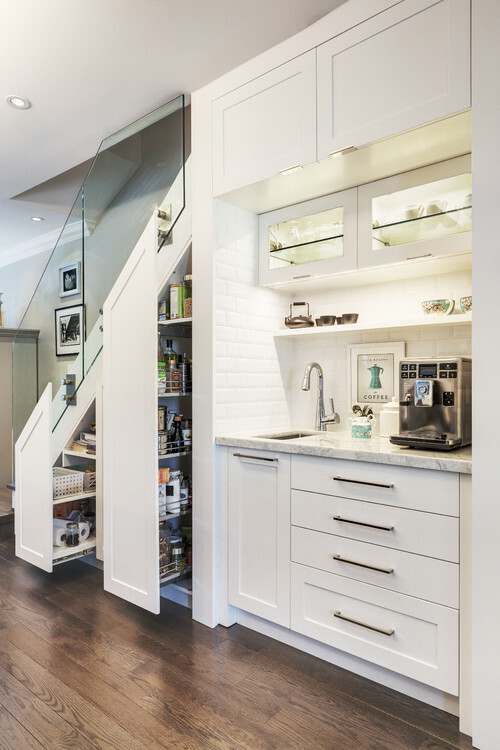 Double up on functionality by adding pantry storage. It makes for good use of space and gives you a great excuse to make your laundry room bigger than the bare minimum. Stealing a slim storage space from where it otherwise would be wasted can be a great way to store small kitchen essentials. If you check in with a good contractor during construction, you may be able to find some empty wall-cavity spaces to turn into smart storage niches. 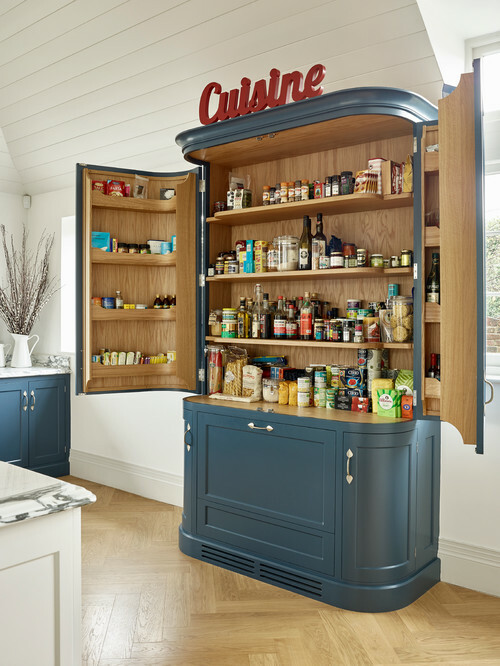 This sort of niche can be left uncovered for modern-style open shelving or given its own set of doors like a typical cabinet to suit any style of decor. 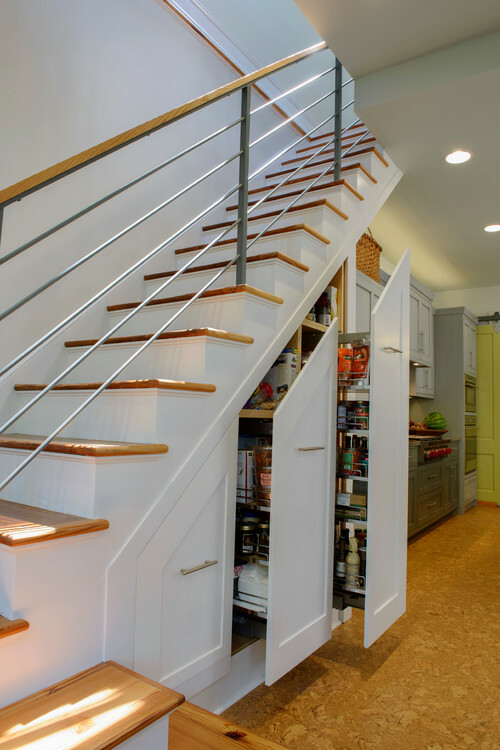 I love seeing creative uses for those odd angular spaces under the stairs, and pull-out pantry cabinets like these are a genius option if you happen to have a staircase near the kitchen. So often the cavity under a staircase goes unused, and with its odd shape, it can be hard to access. Slim and tall pull-out drawers allow you to access the storage without having to crouch and root around inside a crawl space. 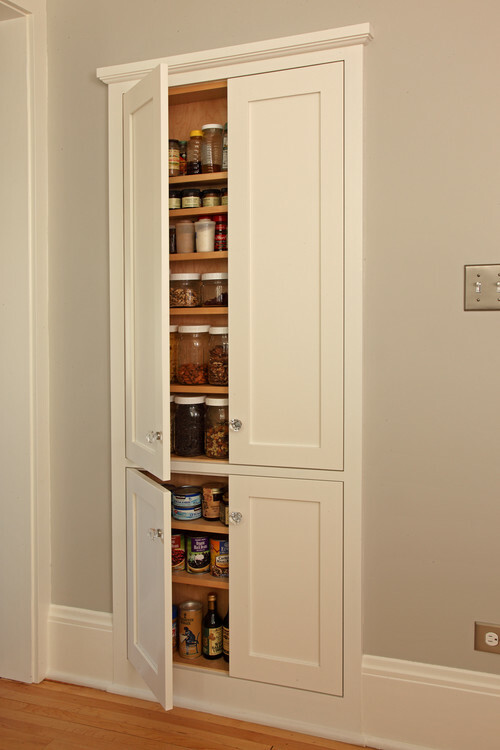 This sort of storage works for small containers, so a pantry is a natural fit. For a simpler solution, a standard shelf cabinet will provide lots of storage, especially for bulky pieces like small kitchen appliances or seasonal serveware, which aren’t accessed as often. Moving these out of the main kitchen cabinets will give you more room for small pantry goods right in the main space. Keep in mind that you will have to have doors custom-fitted and stagger the heights of the cabinets (or have them custom-built), which makes this type of cabinet more of an investment than a standard cabinet installation. But the ample storage makes it an idea worth considering. Skipping the upper cabinets in exchange for having a more open-looking kitchen is a popular trend, but obviously, this eliminates some storage. 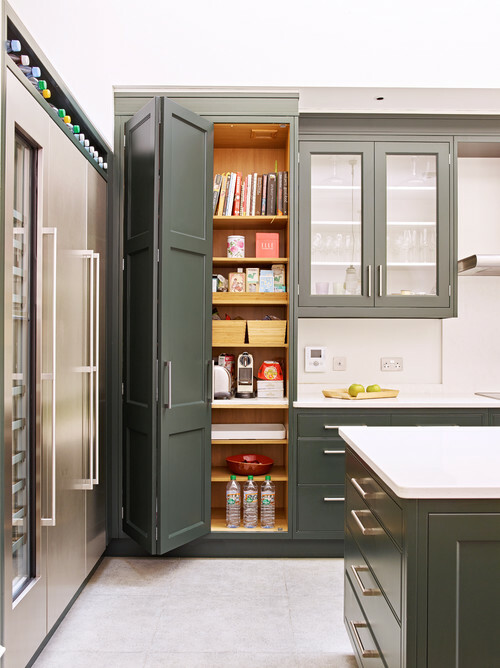 Balance the two priorities by using a full-height cabinet at the end of an L-shaped layout to get a little extra storage (as a doored pantry, open cabinet or both) without drastically shrinking the room. Sometimes spaces in the home have to serve double duty, and one such space is often the home office, especially when such a room is only used occasionally rather than for a work-from-home career. For those who aren’t driven to distraction by a bit of clutter, the office can double as storage space without physically interfering with your work. 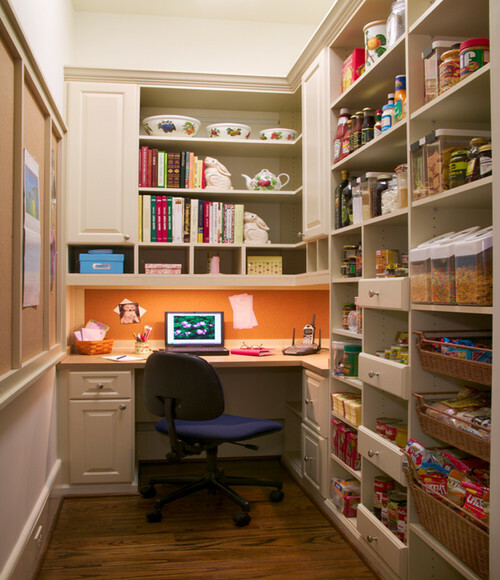 Perhaps it’s better to think of it as a luxe walk-in pantry that also has space for a computer. 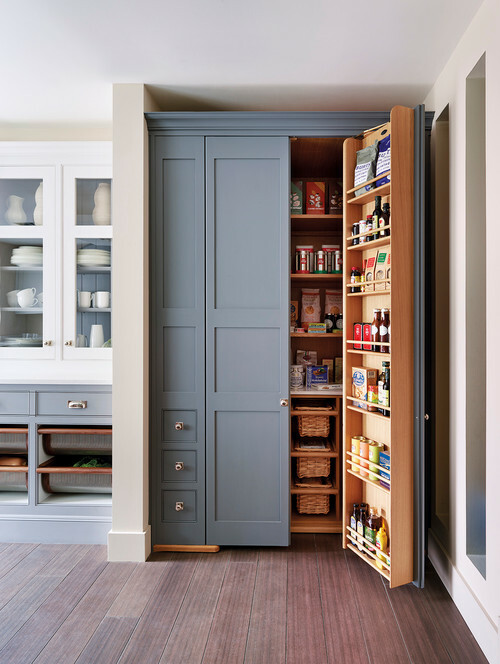 Putting the pantry near, or in, the entryway doesn’t always place it immediately adjacent to the kitchen (depending on your layout), but as a trade-off, it adds the convenience of being able to load items directly into storage without having to carry them all the way through the home. If you dream of being able to drop a few grocery bags and put them away right then and there, putting your pantry in the entryway will save you some heavy lifting. The open-shelving life isn’t for everyone. Keeping household goods on display takes some planning and some maintenance to keep from looking cluttered. 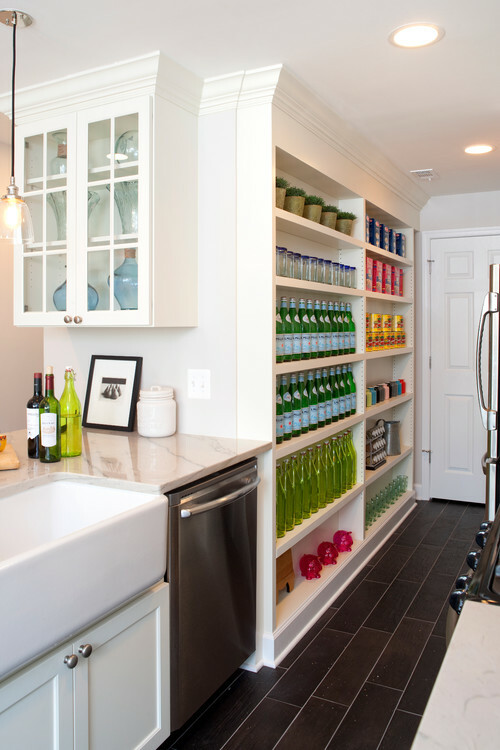 But this style of pantry storage can create a beautiful feature when used to display attractive pieces like glass bottles, baskets of snacks or anything else you like the look of, especially when stashed in multiples like this. 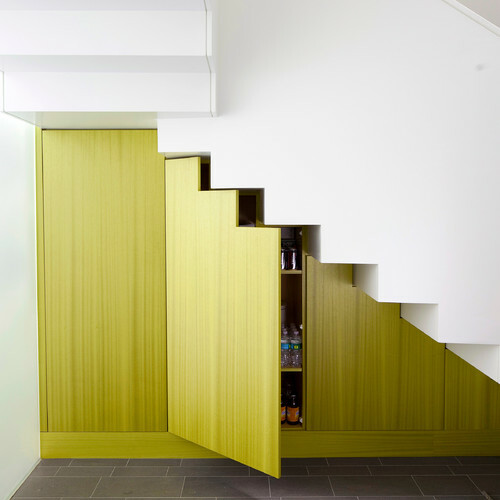 The major advantage here, besides items being easy to grab, is that eliminating doors also eliminates the need for swing-space for them to open, allowing some storage to fit into a tighter passageway. This fun final idea isn’t commonly seen, but it certainly adds a unique twist to home and makes smart use of space too. 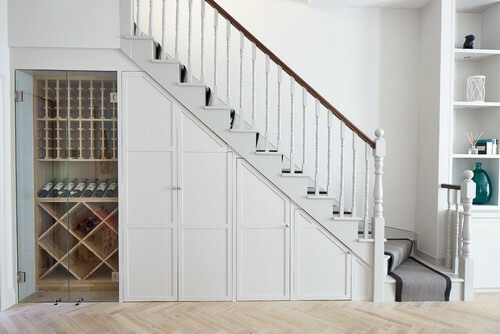 Instead of a typical door, a deeper door with built-in shelving steals a little extra storage from a completely unexpected place and disguises a hidden passage to a top-secret room for a little sense of intrigue.